To my six year-old, more literal, mind the idea of a “Mushroom Factory” did not make sense. Factories were those things that featured on “Industry on Parade,” a series of short films that Channel 10 seemed to show continuously when I was young. They were places of steel and iron, and boiling cauldrons of liquid metal. Not a place to “manufacture” something like mushrooms. Mushrooms grew out in the soggy woods, and were the things that Grandpa and Uncle Wayne and I would tromp though late Spring afternoons looking for. 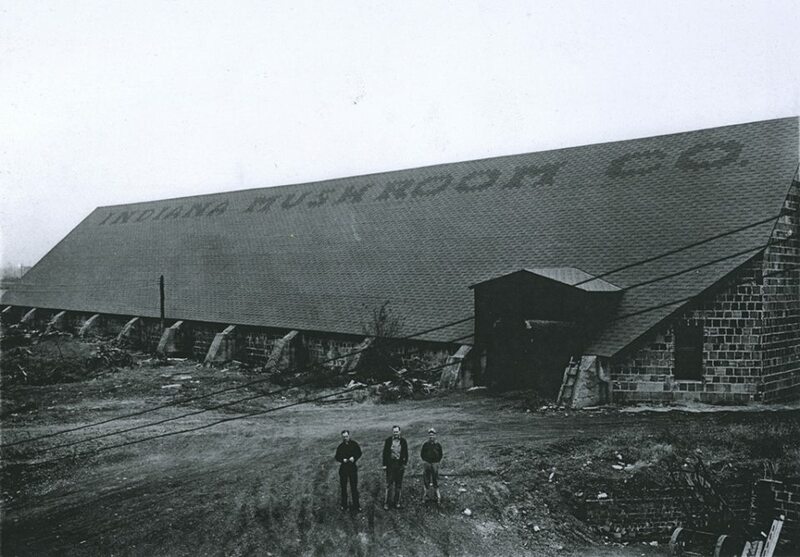 The Indiana Mushroom Corp was a subsidiary of the Michigan Mushroom Company. The company took over the defunct clay tile plant west along the National Road in 1938. 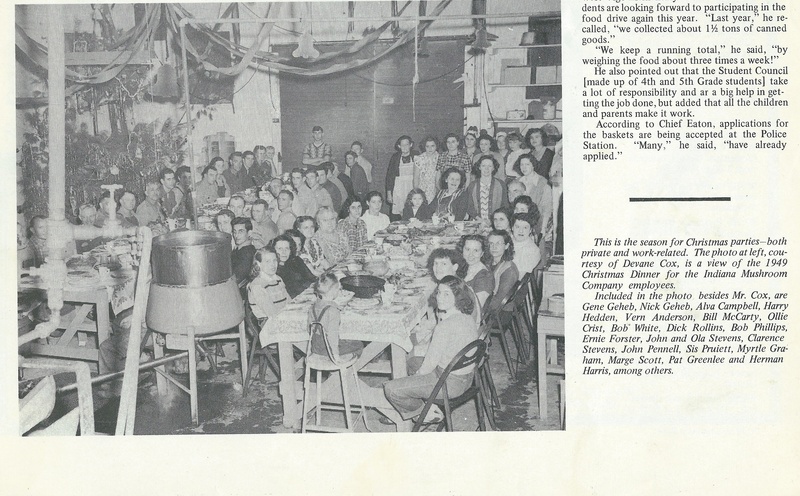 It spent the early part of 1939 refurbishing the plant and making it ready for the first “planting” In April the plant manager V.E.Pederson told the local press that “all the raw materials” were in place and the growing would soon begin. The first crop would be ready for harvest in in 6-8 weeks. He noted that five railroad car loads of manure were being delivered each week. The manure was then treated with chemicals to prepare it. The initial workforce numbered 25, but would increase to over 100 employees. This was exciting news for an area still wracked by the Great Depression. True to his word, the first crop was harvested and canned by the first week of June. The initial crop was sold locally, but soon mushrooms from West Terre Haute were shipped across the country under the “Dawn Fresh” label. The company was indeed a boon to the local economy. Eventually it would also can tomatoes from local farmers in season. By the 1950s, the plant was approaching a quarter of a million dollars in sales. But how did one “manufacture” mushrooms? The best description I have found is the one below. It comes from a 1945 lawsuit filed to determine which of the four unions that claimed members at the plant would be named the primary bargaining agent for the workers in future labor negotiations. mushrooms on a large scale, and in the seasonal canning of tomatoes. are obtained from surrounding farms and canned on the premises. employees, each of whom is trained to perform a particular operation. growing room must be controlled and the growing boxes watered daily. artificially cooling them in the summer. The plant continued to be a prime employer in Sugar Creek Township. It was not the most glamorous of work. Jack D Flowers’ job “was to stick a thermometer in that chicken poop to take the temp.” In addition to those working there, it benefitted local farmers who sold tomatoes to it during the season. Howard R. Baugues recalled that his dad used to haul chicken manure to the plant back in the late 40’s/early 50’s. While Arthur Hall remembered that local farmers and gardeners were allowed to go into the tunnels and dark rooms of the plant to shovel compost for their home gardens. The beginning of the end for the plant was a massive fire that took place in August 1964. It took over 50 firemen to control the blaze, but not before the plant suffered over $150.000.00 in damages. This is much the same daunting view that the first pioneers into Sugar Creek Township faced as they crossed the Wabash. Pioneer is a powerful, image-provoking word in the American lexicon. The ideal/myth of the pioneer is one of the bedrock foundations of how United States views itself. We are descended, says the sentiment, from the sturdy individualists who tamed the ever-moving frontier. The Terre Haute of 1818 looked less like a town and more of a few clearings in the woods. Stands of tall oak trees dominated the vista, beneath them thick undergrowth had to be cleared to ease passage for residents and travelers. Ii was founded in 1816 by the Terre Haute Land Company, a group of investors mainly drawn from southern Indiana and Kentucky. 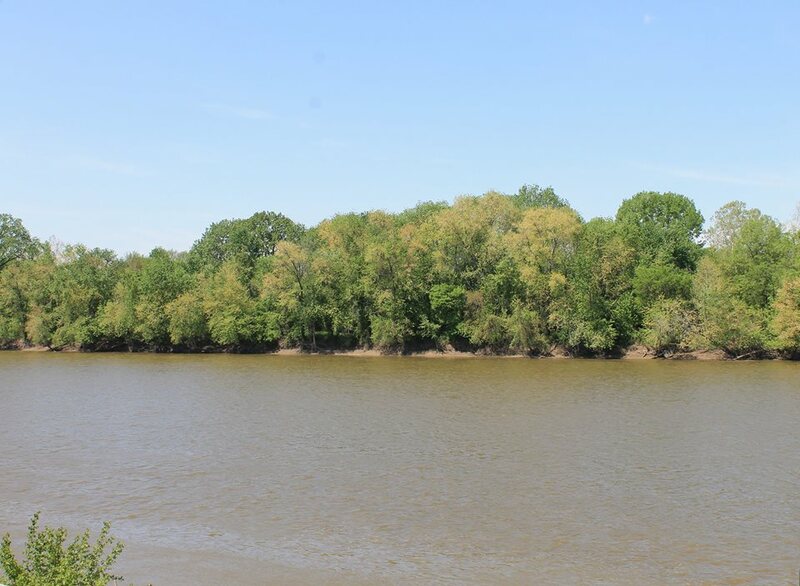 They purchased “thirteen tracts of land on the River Wabash, in the vicinity of Fort Harrison.” One of the “proprietors” was Abraham Markle, a former distillery owner in Canada. Markle was a fascinating character originally from the Niagara Falls area who once served in the Canadian Parliament. After being imprisoned for treason and then released, he switched sides and fought for the Americans in the war of 1812. He then made his way to Indiana, settling on the prairie near Fort Harrison. Markle was the only investor who viewed their purchase as a future home. The land was to be sold for a profit. Accordingly the town of Terre Haute was platted in October, 1816, with the first sales coming within a month. The tracts were covered by timber interspersed with prairies. Early naturalist David Thomas, who spent part of 1816 exploring western Indiana wrote that “the blackness and depth of the soil excite our admiration. Crews migrated to Indiana from Knox County, Tennessee. He was the son of James Madison Crews, a Quaker who was read out of the faith for serving in a Virginia regiment during the Revolutionary War and later moved to Tennessee. There he further distanced himself from his Quaker upbringing by owning a slave. 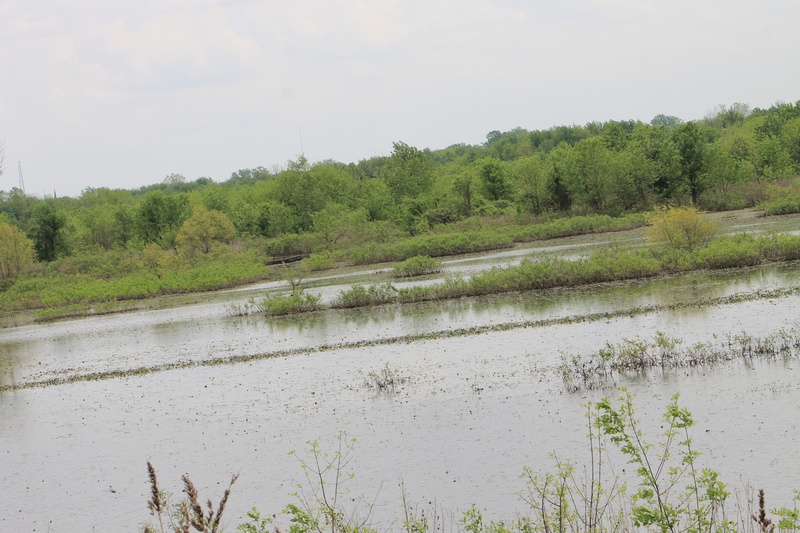 The “Bottoms” between Terre Haute and West Terre Haute. Until a road was “graded up” in 1855-56 this was what pioneers had to cross to get to Terre Haute. Like the majority of early Indiana pioneers, John Crews was from the upland south. This was a simple fact of geography and access. There was a tall barrier for prospective settlers from the north and east, the Allegheny Mountains. It was much easier for southerners to cross into the state. Many roads and waterways provided jumping off points for those from Tennessee and Kentucky and they took advantage of them. For these reasons Indiana was settled from the bottom up, like a glass (which the outline of the state resembles). Besides personal factors there were “attracting” elements drawing settlers into the state. Indiana had been subjugated and their lands were now open to newcomers. There had also been an “advertising” of the state. Travelers like proto-scientist David Thomas had explored Indiana and wrote glowing reports of the richness of the land. Land was cheaper and could be purchased on credit. Some lands were offered as bounties to veterans of the War of 1812. Some took advantage of it, but many simply sold the land for a quick profit. In 1820, 84% of the population resided in the lower third of Indiana. Crews and the others all faced certain aspects of life that came with being a pioneer, as one who is among the first to try to settle the new lands. One was isolation. They were often far from their neighbors, so that they might not see another neighbor for days on end. Town might be quite distant and road were usually little more than rutted pathways through the wilderness. Streams or rivers without bridges had to be crossed. Getting to Terre Haute meant a slog through the bottoms, if the waters were not so high and roiling to make the journey a lost cause. He was hundreds of miles from the family and friends her left behind in KY?. It was not just physical isolation. They were in an information vacuum. They were unaware. What was going in the country? What was the news? Was there a war, who had been elected to what? More important, what was the news from home? Who died, or was born, or got married? Because of this distance post offices kept mail nearly forever, and would post lists of names of those who had mail waiting for them,. Not knowing made life all the more alone, the sense of separation acute. For some, loneliness was a cloak they donned each day. Being isolated also meant that Crews and the others had to be self-sufficient. Each day they had to provide their own food, no markets awaited down the road. Food could be ample in season once they had a harvest or two, but before that they relied on the land, the streams and whatever animals they brought with them. Their diet would make the modern health conscious person cringe at the thought. It was unbalanced, heavy on starches and fats. Cornbread, peas, potatoes, and pork (prepared over an open fire) were the staples. They also had to provide their own shelter. Contrary to what many might think about the emblematic log cabin, it was not the first thing on the minds of pioneers. Their first priority was getting the land ready for planting. Some pioneers might visit their land in the fall so they could girdle tree on their forested acres. Girdling, or cutting around the bark, would cause the trees to begin to die and make them easier to chop down upon their return. Even with the strongest of backs and sharpest of axes, the pioneer usually could only clear one to four acres of land a year. Only then did the settler look to build a permanent home. There are many accounts of early pioneers in Indiana living in caves, if available, or even in hollow tree trunks. Henry Kuykendall’s family, for instance, lived for nearly a year in a lean-to tent as they prepared their land. It is believed that their son, Daniel, the first white child born in Sugar Creek, came into the world as they were still living in the crude tent. Oh, the life of the pioneer….